Iran's supreme leader on Wednesday said he would not permit international inspectors to enter any of the Islamic Republic's military sites or interview the country's scientists under any potential nuclear deal with Western countries, according to reports. 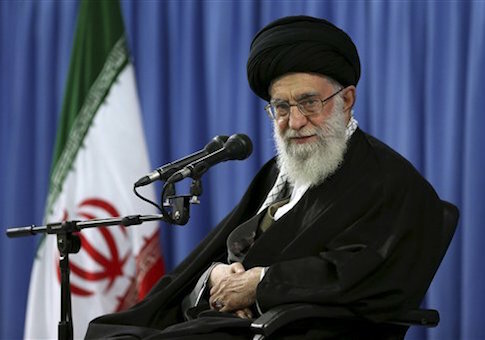 As the clock runs down on a June 30 deadline to reach a deal, Iranian leader Ali Khamenei's latest remarks could complicate efforts by Western nations to discern the full extent of Iran's past and current nuclear work. Khamenei reportedly told Iran's military leaders on Wednesday that he would reject "coercion and excessive demands" by America and the West, according to the Washington Post. Nuclear experts have warned that it could be nearly impossible to monitor Iran's adherence to any deal if it fails to provide inspectors with access to its most sensitive nuclear and military sites. This entry was posted in National Security and tagged Ali Khamenei, Iran, Nuclear Weapons, Sanctions. Bookmark the permalink.